January 16, 2019 -- VALENCIA - The creatures that live under the sea have inspired humans over history, and even the congress poster for ECR 2019 has a nautical theme, but many aquatic species remain elusive. Imaging can help reveal some of their secrets and protect and care for them, a veterinarian from Spain told attendees at a recent congress. Jose Luis Crespo has vast experience of sea mammals, sharks, and other species he helps to conserve at Oceanogràfic, an oceanarium in Valencia, Spain, that opened in 2003, but he admits his team face serious challenges. Imaging of sea creatures presents a unique set of challenges. All images courtesy of L'Oceanogràfic in Valencia, Spain. "There is extreme variability of species of different taxonomic groups. Our knowledge is limited and fragmented and mainly focused on domestic species or aquaculture. The literature on the topic is scarce, and medical technology has been designed for human beings. Of course, delivering care to wild animals in the water is not easy," he said to delegates at at the Triángulo Radiológico meeting, held in Valencia on 10 and 11 January. 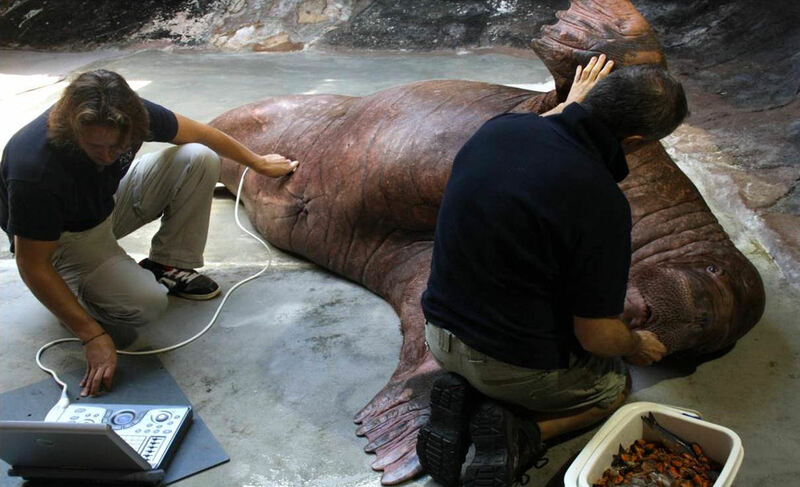 The oceanarium's staff studies the creatures' behavior and provides them with medical assistance by taking into account their clinical history and running cytology and blood tests. Imaging is useful to diagnose and treat the patients as soon as possible, and usually the first-choice modality is ultrasound. Dolphins are sensitive to ultrasound frequencies. 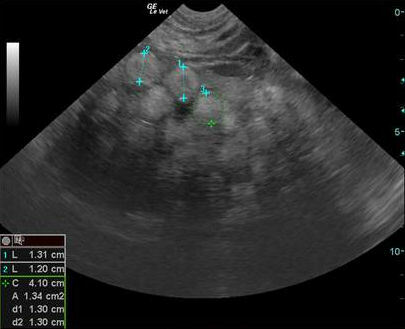 "Ultrasound is versatile, easy to move and transport, noninvasive, and ideal to image soft tissues," said Crespo, an associate professor in the department of animal surgery and medicine at Cardenal Herrera University in Valencia. "Ultrasound equipment is designed to work with humans and pets. We have to use many probes and tricks to obtain sufficient image quality." However, aquatic species have unique physical features that may reduce the penetration of the waves. 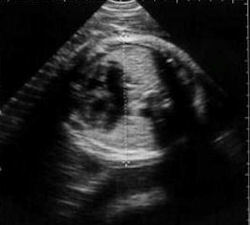 Dolphins are sensitive to ultrasound frequencies and either need to be desensitized by medical training or get used to techniques such as harmonics. Sea turtles' shells also can obstruct the examination. The carapace and plastron are made up of about 60 bones and the outer layer of the shell is covered by horny scales that prevent evaluation. 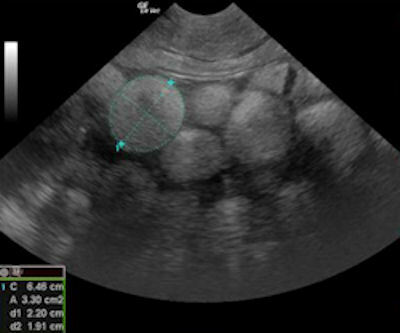 The inguinal fossa, axillar area, or cervical access are the only acoustic windows available for assessment of follicular development and buoyancy problems, as well as a coelomic examination, which is the main region of interest for an ultrasound scan. 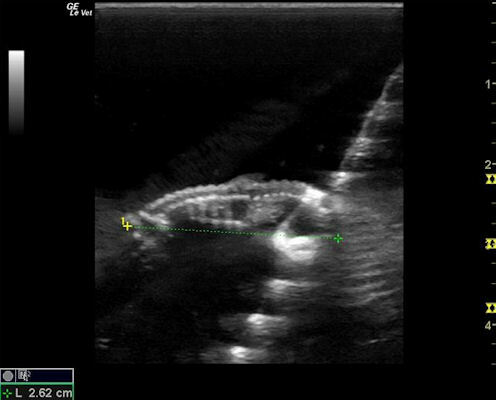 For sea turtles, ultrasound can be used to assess follicular development and buoyancy problems and for coelomic examinations. Fat, gas, and hair also can impair examination quality. Fat and skin composition varies tremendously from one species to the other. While many fish have a very thin layer of skin or scales, sharks present with dermal denticles on their surface that look like small teeth and will destroy the probe if not struck in the right direction. Experience in performing examinations in these unusual patients is crucial to improve image quality. During the examination, Crespo also recommends using specific techniques to increase safety -- for instance, tonic immobility, which consists of placing the animal upside down. "In that position, patients are more relaxed, and we can carry out a more complete examination. Every examination is complicated, so performing an all-in-one scan is of great value," he noted. Imaging examinations often can be time-consuming and require patience, skill, and creativity. Keeping equipment dry is crucial. Ultrasound can be used for daily routine checks of the abdomen, soft tissues, and respiratory apparatus. Vets especially look for the presence of renal calculus, gastritis, foreign objects, and pleurisy or pneumonia, all of which are common scenarios in animals in captivity. Also, preventive medicine is a key aspect in conserving aquatic species, since these patients do not tend to complain. "Wild animals don't usually ask for help. When symptoms appear, the animal is usually too sick to be saved," said Crespo, who is responsible for the Fundación Oceanogràfic conservation programs at the oceanarium. Getting the patients to cooperate is essential but complex. Trainers play a valuable role and can help vets gain more insight in aquatic species. It can take up to five people to image a specimen. A typical combination is made up of two trainers who give directions to the animal and two or three vets, one of whom tries to get to the water line while the others take the pictures. 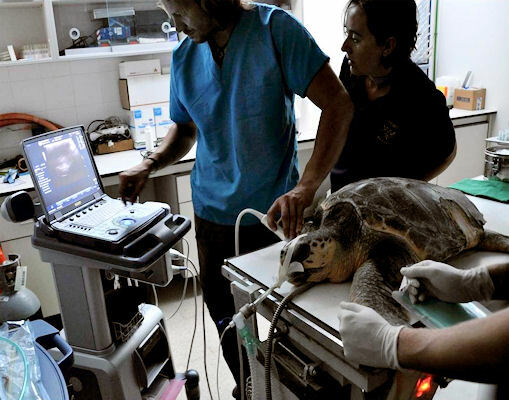 Anesthetic monitoring performed during an examination of a sea turtle. Another way to immobilize the patient is anesthesia, and ultrasound can then become handy to monitor the patient and ensure it is not endangered. Keeping the equipment dry is paramount, and almost every solution works. "We've used wooden and even cardboard boxes to protect the machines. We have to be creative," Crespo said. Lighting also is a factor because the ocean is dark, while the oceanarium is rarely so. To overcome the difficulty of imaging in very bright places, the team use screen glasses that have been specifically adapted for ultrasound exploration. More standardization and research on anatomy and physiology are needed to improve imaging and knowledge of aquatic species, especially elasmobranchs, a cartilaginous subspecies that includes sharks and rays and is problematic to approach. 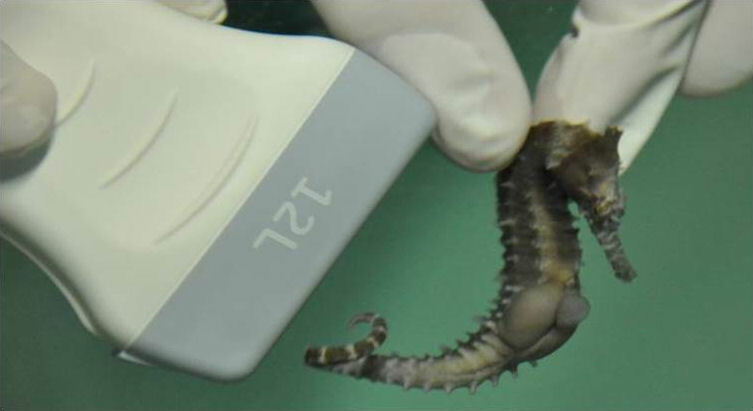 A special interest of zoologists and marine biologists in the captivity setting is to monitor reproduction by evaluating the animals' reproductive tract. 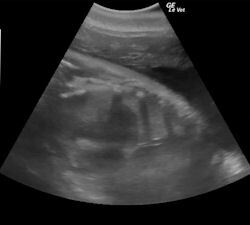 Imaging can be useful to know how well a pregnancy is going, when the baby is due, and if medical help is needed. For instance, Crespo's team was able to save a baby dolphin during a complicated birth, thanks to the cord measurements taken on ultrasound. "The cord could have strangled the baby, but we knew the size and managed to deliver him safely. Further births were also successful using the information provided by ultrasound," he said. In addition, ultrasound can be used for assisted reproduction in penguins, sharks, and turtles; artificial insemination in beluga whales; and artificial stimulation of the reproduction cycle in European eels, a species that is currently threatened by extinction. But ultrasound may be impossible in some situations and even some species, such as marine birds with subcutaneous emphysema. In that case, ionizing radiation is preferred, and, as with humans, x-rays tend to work best for imaging of bones and lungs. Classical radiography is easily accessible and available in most aquariums, and it's easy to interpret. It's the preferred modality in birds. 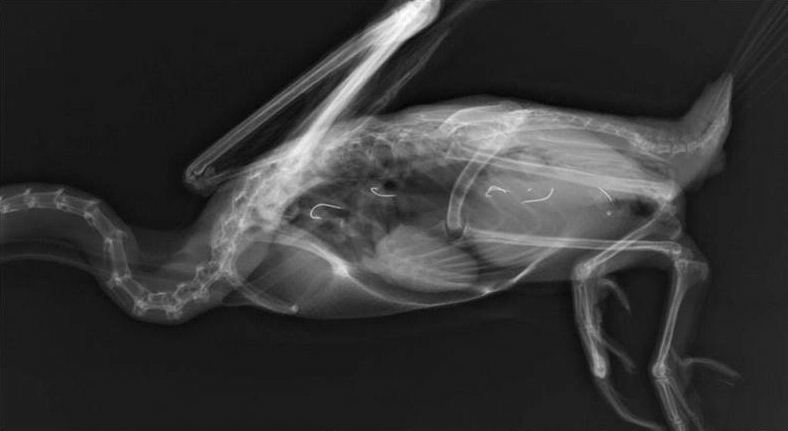 X-ray remains the best modality for marine birds. 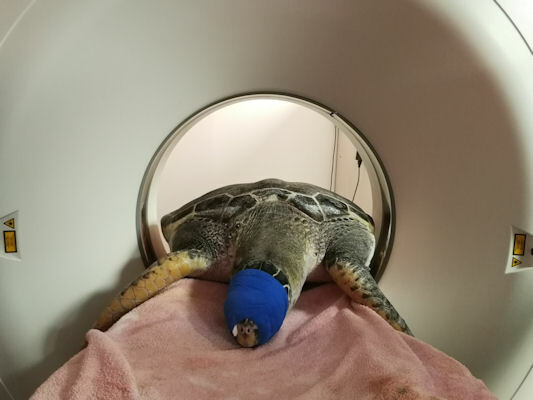 Endoscopy, though challenging to perform, is used in a myriad of applications, including determining sea turtles' gender and obtaining information that can help protect the species. 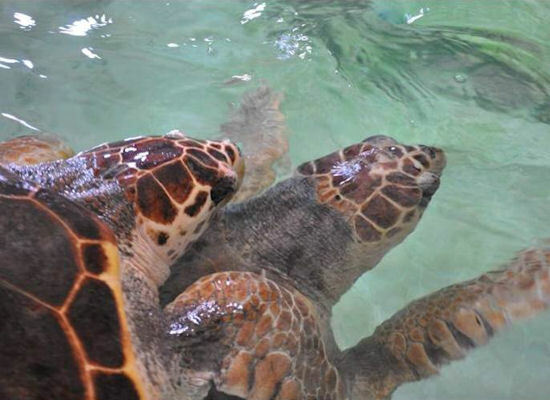 "One must typically wait until turtles are 30 to know their gender, but having this information earlier is important for population ecology, especially in coastal areas, where the increasingly warm waters produce almost exclusively females," Crespo explained. Sick animals may be complicated to approach even for their trainers. In that case, thermography can help determine if a patient is healthy from a distance. CT, MRI, and PET/MRI are used in complex cases, such as endangered sea turtles with decompression sickness. Crespo and his team have also started to use CT, MRI, and PET/MRI for research purposes and to image complex cases such as endangered sea turtles with decompression sickness due to fisheries interaction. The oceanarium uses the scanners provided in the nearby Health Research Institute La Fe. Some patients, such as walruses, can weigh up to 1,500 kg, which can be a limitation even for the strongest equipment. The effect of magnetic fields in sensitive species such as sea turtles also remains to be assessed. A walrus can weigh up to 1,500 kg. But technological advances will benefit aquatic species, along with humans. "As the techniques become more available, we will also try to use them in our daily routine," he said.